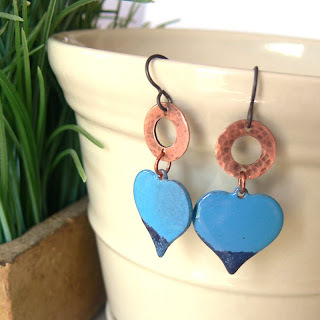 Pretty Things: Enameled Jewelry -- I finally made some! Remember when I wrote about Barbara Lewis, who taught me how to enamel beads? And, of course, my need for a refresher course at Maryland Hall in October? (Only one space remaining as of this writing, so hurry and register!). Well, I wasn't a complete and TOTAL failure at enameling -- I just think I did what I always do when I get over-excited in classes and rushed through and didn't take the time to appreciate the relationship between the flame and the bead and the enamel. So I'm excited to show you these earrings I made here at home in my own studio. Rather than continue to burn up brass filigree beads (and oh how I want to master enameling those beauties!) I turned to copper plates. These held up to my duel-fuel lampwork torch more readily, and I was pleased to finally get it right. I then hammered copper washers for the tops. If you're interested in getting the copper parts for these earrings, visit Fundametals.net -- they have a huge selection of copper designs! Hope to see you in Annapolis, MD, in October! Lori Anderson makes jewelry for Lori Anderson Designs. She also writes for the blog An Artist's Year Off and occasionally contributes to Art Bead Scene. She dreams in color. I went searching for enamelling supplies the other day...Nothing here. Oh wow, Lori, no wonder you're pleased with yourself! I look forward to seeing future enamelled work. Lori - they're beautiful! Bravo to you - I SO want to learn enameling! Lovely...I really like how the heart is two-toned! These look so good! They look like they've been dipped or are dripping blue..my favorite color. Congrats! OOhhh - another thing for me to try. They are beautiful. I know enameling is all the rage right now, but I have no idea how it's done. So luckily, I'm wildly impressed everytime I see it! Great job! those are so pretty, Lori! Great job, Lori! These look wonderful! Great work, Lori! I am still trying to master the art myself. They are really great Lori! I am half afraid to look because I might get addicted to something else! I love the contrast of the smooth enamel and the textured copper...not to mention the color! Lori, these are SO pretty!!! Did you make these just today after we spoke?? You go girl. :-) And btw, love that shade of blue you used! Kudo's Lori. I love the blue with the copper. I wish I could take that last spot in class. Oh how pretty these are! You are most certianly a jack (OK Jill) of all trades! Lori those earrings are the bomb! I hope you have a great time at the refresher class. I so wish I lived closer so I could attend. Keep up the wonderful work! They are beautiful, congratulations! Looking forward to seeing more. Those are so great and fun! See, your year off for exploring is working. Good for you! Very pretty! I wish I lived closer and could take Barbara's class. I love torch enameling and am ready to sprout a new direction in my jewelry. Oh what FUN!!!!! I luv the hearts!!!!!!!!! Gorgeous! Love the colors. Great job! Lori these are just wonderful! Wow another feather in your cap! I should of stayed in VA lol.